Looking at the list I have determined that I have several of these symptoms, so how do I know it is Candida. These symptoms can be the cause of many things, like aluminum poisoning, inoculation residue and even the HPV or Epstein Barr viruses! Well since I have detoxed several metals, parasites, viruses and other pathogens, I assume the only thing left that my symptoms relate to is Candida. I went in search of more info and found an online quiz and a home test. How To Tell If You Have Candida – The Free and Accurate Candida Spit Test. 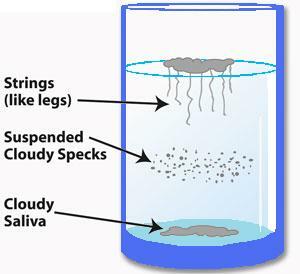 If, within three minutes after spitting into the water, you see “strings” hanging down, cloudy specks showing up in the water, or “debris” sinking to the bottom, you most likely have extensive overgrowth. If it takes longer than a few minutes for anything to show up, the candida is not as serious. If the saliva just floats on top and the water stays perfectly clear, you most likely don’t have candida overgrowth. Candida concentrates in saliva overnight, so this test is most accurate first thing in the morning. Unfortunately, the environment in which Candida thrive means that the pH balance is acidic. This acidity inhibits the bodies’ ability to absorb vitamins and minerals, and it limits enzyme production of digestive proteins. One of the side effects of limited enzymes leads to indigestion symptoms, wind or gas, a sense of the intestines being bloated or swollen, increased acid levels and sensitivities to certain types of food. I chose to use the Inno-Vite Candida Cleanse. It is fairly simple, just take one concoction in the am and then probiotics before bed. I have added black walnut tincture and Pau D’Arco to my daily regiment as well. This real issue is the change in diet. As you can tell by the list below, it can be a challenge for most people. I have to admit it isn’t too bad for me since I rarely eat wheat, dairy, sugar (although I started craving chocolate). My cravings are fruits, which add to sugar and wine…same as pure sugar me thinks. I eat yogurt or Kifer daily for the probiotics so that has been a change for me. Foods containing refined sugar include: white sugar, brown sugar, honey, maple syrup, corn syrup, maple sugar, molasses, date sugar, turbinado, raw sugar, demerrara, amasake, rice syrup, sorghum. Foods that contain yeast are typically eliminated. Yeast-containing foods include: Baker’s yeast, Brewer’s yeast, Engevita, Torula, and any other types of nutritional yeast. Includes all types of vinegar, such as white vinegar, red wine vinegar, apple cider vinegar, rice vinegar, and balsamic vinegar, and any food made with vinegage, such as mayonnaise, commercial salad dressing, ketchup, Worcestershire sauce, steak sauce, BBQ sauce, shrimp sauce, soy sauce, mustard, pickles, pickled vegetables, green olives, relishes, horseradish, mincemeat, and chili sauce. Peanuts, peanut butter, and pistachios are thought to have mold contamination, which is why they typically aren’t allowed on candida diets. Includes regular coffee, instant coffee, decaffeinated coffee, and all types of black tea (including “fruit flavored” black tea). As you can see the list of avoid items is extensive. It is best to consider what you will eat and prepare a few things before beginning in case the detox puts you into a healing crisis. The first three days I experienced low energy, bloating, headaches and I was cranky. I am at the end of week one and although I haven’t dropped any weight I have noticed that my skin is better and so is my digestion and my mood swings have definitely improved. Not bad for the first week. I am beginning to notice a cravings for alcohol, I’m not sure if it’s because of summer and being at the beach or the Candida causing the cravings, hmmmmm. In my attempt to find a healthy snack that fills the gab when hungry and busy or those darn sweet cravings I have tried a couple of things I thought I’d share with you. 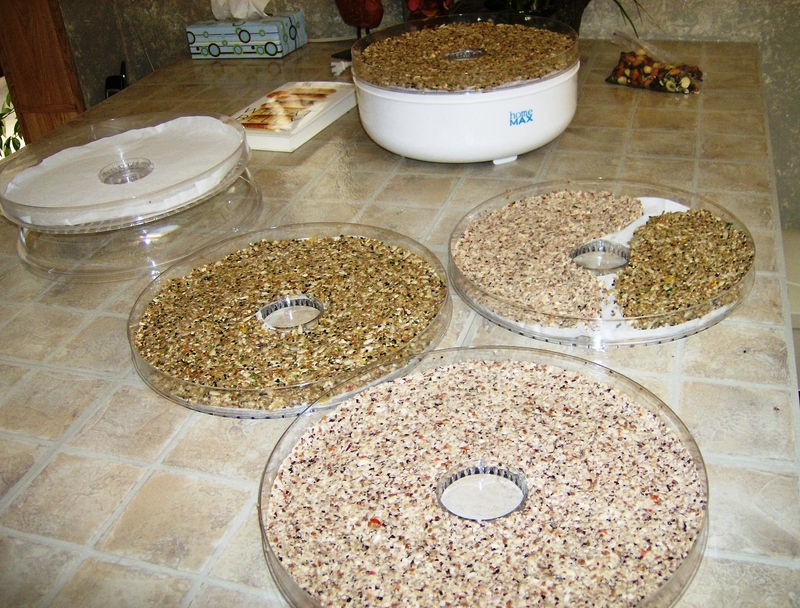 The first are raw crackers, fairly easy to make but you need a dehydrator. Below are some pictures and the recipes. 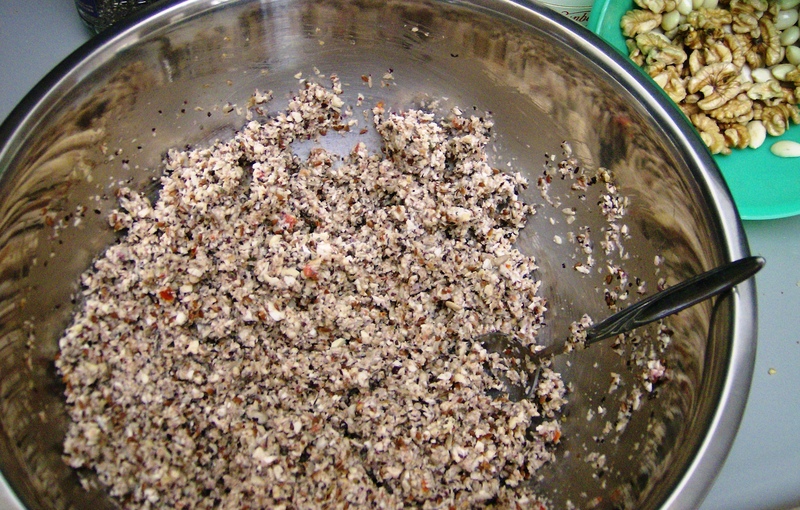 Mix in food processor. 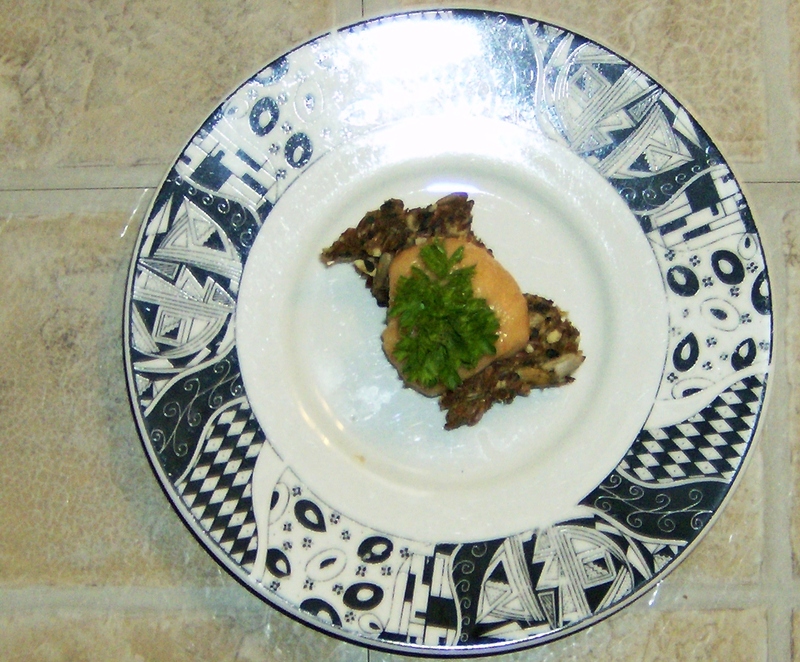 Spread on parchment paper or TefIon sheets. Make them very thin. 2. Spread batter on parchment paper or a teflex sheet. FYI: Do not use regular waxed paper. The crackers will stick to the paper and be difficult to remove. Buy parchment paper or teflex sheets. Remember that the above recipe should make two dehydrator sheets worth of crackers. Spread the batter out evenly. Using the back of a spoon works well. 4. Score the crackers. Once the crackers are starting to harden up (four hours later? ), use a knife to score the crackers along wherever you want the crackers to separate. This will make them easier to break later on. 6. Finish dehydrating. Some people like their crackers a bit moist. I like them to be very dry. If you plan on keeping them for a few weeks or more in storage, then you must ensure that there is no moisture left. A good way to make sure that they are really dry and dehydrated is to pinch them hard. If all of the moisture is gone, you should not be able to feel any movement. If you pinch a cracker and it gives a little, it needs to be dehydrated longer. I dehydrate my crackers for a long time. Perhaps even 20 hours or so! That might be overkill, but it’s what I do. 7. Eat and enjoy! I love avocado, sprouts, and tomato on raw crackers. Mmm! I enjoy left over grilled salmon on them or bean dip goes well with them too. They are got delicious and are a nice compliment to any meal or snack. For my sweet tooth I made some organic spelt flour and oat muffins with unsweetened carob chips and xylitol as a sweetener, they are fantastic! I add spices, you choose, what you like, mine are cinnamon, nutmeg and clove; 1 tbs of each. Preheat oven to 350 degrees. Beat wet ingredients together in a bowl. 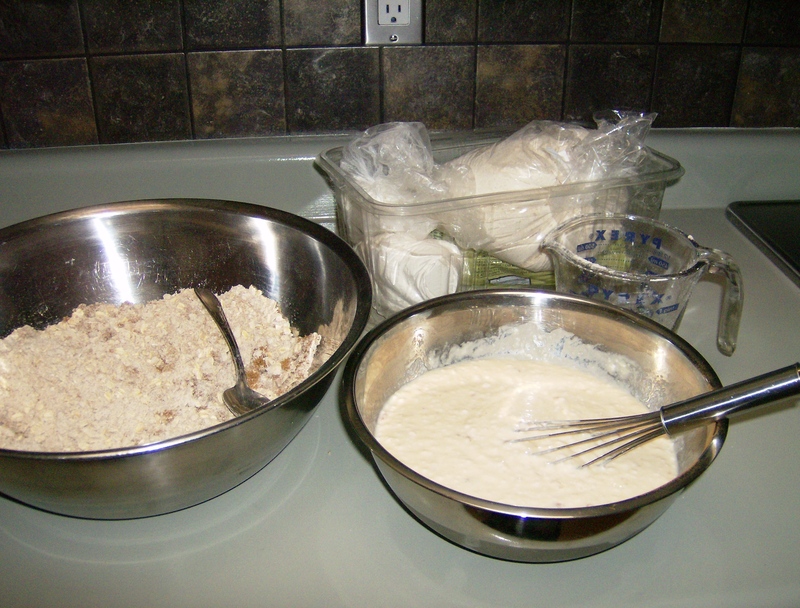 Combine dry ingredients in a separate bowl. Mix the two together. 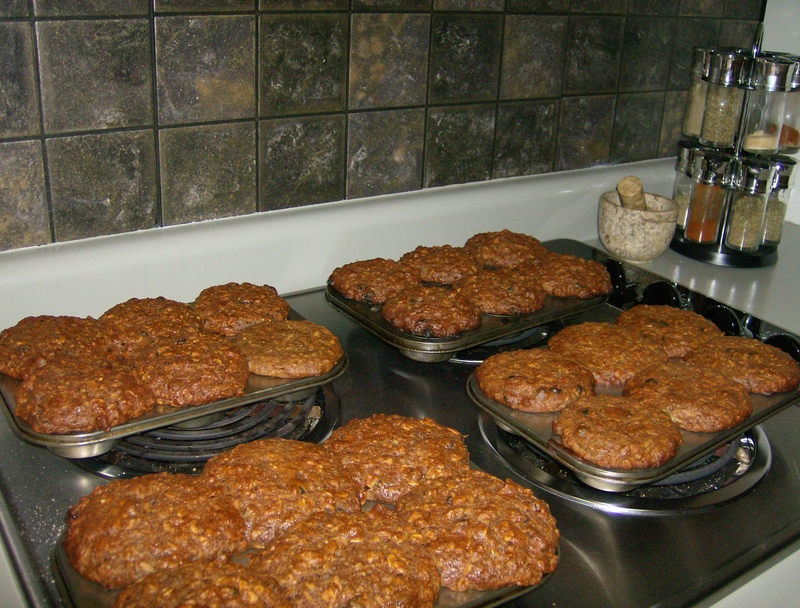 Put in lined muffin tins and bake for 25 minutes. 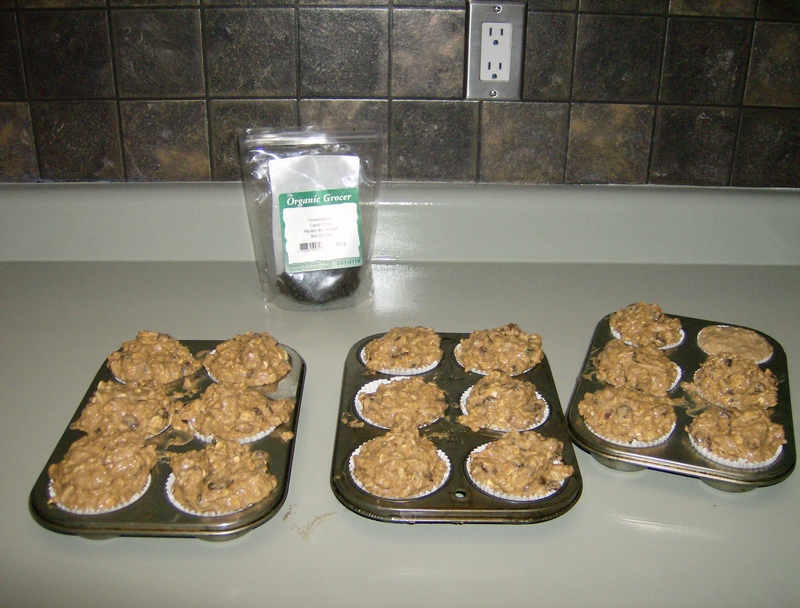 These muffins are great for breakfast, I cut one in half and use as a dessert in the evening. The other thing I have been making that is fast and easy and fills the void are shakes. 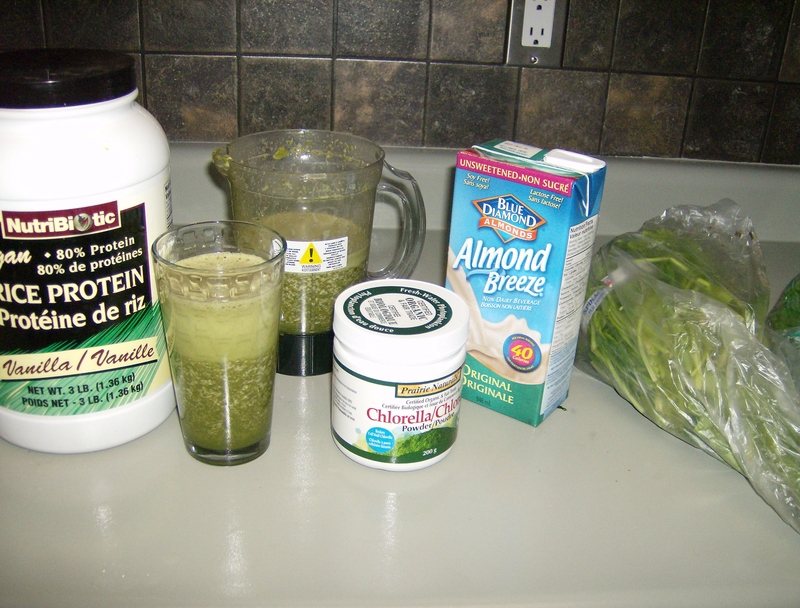 So what is in a smoothie that can’t have fruit or sugar because of a Candida cleanse, you ask…spinach, parsley, cilantro, ginger, cinnamon, pinch of cayenne, celery, chia seeds, almond milk, rice powder, xylitol and coconut oil. One other thing that I should mention that is great is making unique iced teas. A tall glass of iced tea on a hot day is refreshing, and it might also do your body good. Studies show if you drink tea regularly, you may reduce your risk of Alzheimer’s and diabetes, plus have healthier teeth and gums and stronger bones. How? Tea is rich in a class of antioxidants called flavonoids, which are most potent when tea is freshly brewed. If you want to keep a batch of cold tea in your refrigerator, add a little lemon juice. The citric acid and vitamin C in that squeeze of lemon—or lime, or orange—help preserve the flavonoids. These iced tea recipes are a delicious way to enjoy this beneficial beverage. I try combo like white tea with cinnamon sticks or white tea with ginger and mint. I just make it really strong and then add it to 1.5 liters of filtered water and keep it in the refrigerator. For those of you who would like any of these sweetened simply use stevia or xylitol. Here we balance the mildly grassy flavor and slightly astringent mouthful of green tea with honey and lemon. Over steeped green tea can be bitter, so don’t brew it any longer than 3 minutes. And be sure to steep in simmering water: water that looks like it’s steaming, with little bubbles, but not boiling. So what are the top Candida fighting foods you ask? Use them often and wherever you can! I hope this blog has given you some ideas of food choices and recipes should you find yourself in need of the dreaded Candida Cleanse…perhaps the fall when fruit isn’t so plentiful is a better time to embark on this one! ← Paradigm Shifts, Uncomfortable?…Hell Yes. Transcending?…Absolutely! Congratulations! I admire you for your determination, this is a very strict regime. How long would you stay on a program like that? The fresh fruits and veggies are so plentiful right now, I think it would be wise to wait until winter! I am having a hard enough time staying away from the sugar, dairy and breads! Health and good fortune to you! I will try to stay on the program for 4 weeks hopefully I won’t miss cherry season! Thanks for sharing. I have used that test in the past and I’m with you it works great yet I had forgotten about it. Thank you for reminding me as Candida loves me and I should check regularly for it. Everything is showing up fine on both my firefox and my explorer browsers.